If you play electric guitar, chances are you’ve heard of John Petrucci and Dream Theater. You may even know of our 30-Year relationship building many of his favorite amplifiers – the very same amplifiers you might have chosen for your sound. This distinguished list includes the MARK IIC+™, Dual Rectifier®, TriAxis™, MARK IV™ and MARK V™ to name a few. Inspired by our long standing relationship with John Petrucci and more than 30 years of collaboration we are proud to introduce a MESA® first; The JP-2C™. Our first unlimited-build Signature Amplifier. In celebration of John’s talent, his life-long dedication to our shared art, and the long relationship we’ve enjoyed with him, we are proud to introduce a MESA® first; The JP-2C™ - Our first unlimited-build Signature Amplifier. And YES… it’s a MARK IIC+! A next generation Re-Issue of the legendary amp so many Recording Artists, MESA enthusiasts and Tone Freaks the world over covet, often searching high and low to find. Only THIS IIC+ pulls in an enhanced feature set born from our collaboration with John over a period of three decades of research and development. Much like a race car or fighter jet, the JP-2C strips down to bare essentials to get the job done effectively, in the simplest way. It’s a purpose-built, no compromise rendering that aims at one single goal; deliver the most aggressive, purest sounding IIC+ EVER in a versatile package that delivers the goods to meet John’s recording and stage needs. All Things Heavy! But more specifically; the highest headroom Clean sound possible, a Crunch rhythm that has Lead Channel gain available, but is tight, grinding and articulate, and the ultimate Boogie® Lead Channel with access to even more saturation and the ability to track any technique and speed while also reaching to the stratosphere for single note solos. In that spirit, unlike other MESA amplifiers, the JP-2C foregoes the concept of multiple voicing Modes derived from other MESA circuits and instead dedicates each of the three Channels exclusively to circuit voicing’s of the MARK IIC+, including the new SHRED Mode, which further enhances the top end harmonic layering of the original IIC+ Lead Circuit. Channel 1 is dedicated to Clean sounds and is optimized for the maximum headroom possible in the preamp section. Power section clip may be employed to attain some degree of overdrive in Channel 1, albeit at very high volumes due to the 100/60-watt rating of the JP-2C power section. Additional “drive” may be sought in the upper region of the MID control (above 12:00 noon) as the MID pot employed here is the same value and taper as our MID/BOOST control found on some of our newer MARK SERIES amplifiers. However, increased headroom in the preamp reduces the amount of overall “gain-boost” available as compared to our other amplifiers with this feature. This fact renders this more powerful MID control as just that… a MID that has increased range to add more midrange frequencies and a “cleaner” gain-boost into the mix. Channel 2 is the JP-2C’s Crunch generator. This Channel is all about aggressive, tight overdriven rhythm sounds delivered with amounts of Gain usually associated with Lead Modes or Channels. It IS in fact a Lead Channel… the LEAD Channel from the MARK IIC+ in its original state circuit-wise. The setting of the Gain has been optimized for its performance in this category of sounds and though it can definitely be used for Lead sounds of all kinds, it is perhaps the best choice when dedicating a Channel in the JP-2C to Crunch rhythm work. To achieve the most famous, now classic MARK IIC+ grinding rhythm sounds in Channel 2, you can now employ one of two 5-Band Graphic Equalizers…yes, here in the JP-2C, you have a separate EQ for each of the high gain Channels! This means greater flexibility and improved accuracy when crafting your sounds and allows you to arrive at a truly no-compromise set of sounds for both rhythm and lead! This was something that was impossible on the original MARK IIC+, hence the fact that many top Artists of the day used two MARK IIC+s and a Midi switcher (also contained here) in a rack system to call up dedicated amps with different settings for each sound. In both Channels 2 and 3 of the JP-2C, we have removed the VOLUME 1 Control and the LEAD MASTER control from the Panel Layout as compared to the LEAD Mode of the original MARK IIC+ in favor of user simplicity. The LEAD MASTER is a largely redundant control here in the JP-2C and its setting has a very minimal role in the sound. The VOLUME 1 is a bit more sensitive and critical, and here in the JP-2C it is preset internally (as we did in our MARK V) to its optimum setting for each Channel. The end result for the user is an amplifier that is MUCH easier to dial and arrive at the very best of the MARK IIC+’s most signature and mind-blowing sounds more quickly and with less “neurotic tweaking” required. There is NO compromise of the original’s performance and yet a SERIOUS benefit in the dial-ability of the JP-2C. A long time MESA Feature, directly off the classic MARK IIC+ and at the heart of this amplifier is the 60/100 Power Switch. 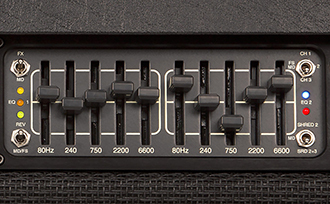 One of the very first “modern amp” features MESA pioneered in the late ‘60s, this switch puts the center two power tubes in Standby Mode and allows you to operate at a reduced power setting. Channel 3 is created with soaring lead sounds in mind. Our first priority was to meet and even exceed the incredible explosive attack, blistering sustain and harmonic complexity of the very best of the MARK IIC+. We, along with the amplifier’s namesake, feel we have achieved exactly that. Channel 3 boasts all the nuanced performance of the originals and delivers it with unbelievable authority due to the 100-watt Class A/B (versus 90-watt Simul-Class™) power section. This difference in power section serves John’s musical style extremely well - In fact, his absolute favorite amplifier of the many IIC+s he owns is a 100-watt model. Channel 3’s character is therefore a little warmer, fatter and compressed and this plays well into its intended application for lead work of all styles and gain requirements. A long-time MESA feature, directly off the classic MARK IIC+ and at the heart of this amplifier is the 60/100 Power Switch. One of the very first “modern amp” features MESA pioneered in the late ‘60s, this switch puts the center two power tubes in Standby Mode and allows you to operate at a reduced power setting. This is great for smaller venues, rehearsals, increasing power tube life by swapping and also imparts a slightly brighter, snappier response that some find desirable. It also allows more power tube saturation at lower volume levels for those who may find that preferable. Either way, the 60/100 switch adds versatility and options to the already impressive arsenal here in the JP-2C. In the JP-2C we’ve internally preset the former PULL SHIFT Features of the IIC+ to their optimum settings to simplify and enhance both high gain channels 2 and 3. We've also included new PULL GAIN and PULL PRESENCE for added tone shaping. In addition to the VOLUME 1 and LEAD MASTER control deletions from the original circuit, we’ve modified the PULL SHIFT feature layout of the original IIC+ to both simplify and enhance both high gain Channels 2 and 3. All PULL SHIFTS that were possible in the original IIC+ LEAD Mode are internally set to their optimized settings based upon the historical polling of savvy MARK IIC+ aficionados, artists and the MESA Design Team. In addition to these changes to the original circuit, we have added two new PULL SHIFT options on the JP-2C. A PULL GAIN on the GAIN control and a PULL PRES (shift) on the PRESENCE control. PULL GAIN increases the setting of the internally set VOLUME 1 control by approximately one number setting’s worth… in other words, just a little bit. This means that it is added to the already preset amount of gain/drive that is in place when the pot is NOT pulled out. In both Channels this PULL GAIN feature allows a little boost of gain for specific musical styles. The PULL PRES feature located on the PRESENCE controls allows two very different Presence frequencies to be selected. When PULLED, the time-honored frequency we have used for 45 years appears, which allows control over a much higher range of top end than that of the TREBLE control. When left PUSHED-IN, the PRESENCE control operates on a lower frequency that is still above the TREBLE, but adds “increased cut and focus” lower than the traditional PRESENCE that, at times, can sound more cohesive for high gain Crunch rhythm sounds. In the JP-2C you can now employ one of two 5-Band Graphic Equalizers...allowing you to have a separate EQ for each of the high gain Channels! The ONLY switch in each of the three Channels is the assignment switch for the two 5-Band Graphic Equalizers. This 3-position toggle allows assignment of either of the EQs to any of the three Channels, with the upper position engaging EQ 1 and the lower position employing EQ 2. The center position of the EQ switch allows you to either bypass or Footswitch the EQ on or off. The 10 EQ Sliders that make up the two separate 5-Band Graphic Equalizers are housed in the EQ Window section of the Front Panel. Along with them, this section contains control switches for four other Functions/Features. These are the Effects Loop, Reverb, Channel Select and the SHRED Voicing Mode. This convenient placement alongside the EQ Faders in this Window allows you to dial in your individual sounds and selections quickly and in one place, so that when storing the settings you have arrived at for a given sound under a Midi program number, there isn’t the need for a lot of jumping around on the Front Panel. The JP-2C incorporates a new voicing feature in the high gain Channels not present in the original MARK IIC+ LEAD Mode that further enhances the harmonic layering of the top end. 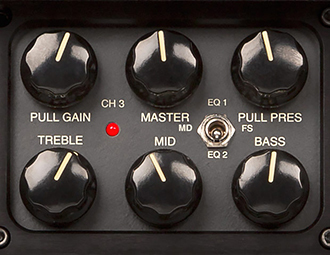 This 3-position switch located to the lower right of the EQ 2 window affects only Channel’s 2 and 3 and adds an additional layer of upper harmonic content in the high gain Modes. It is especially beneficial for high gain Crunch Rhythm sounds as it lends aggression and three-dimensionality to the sound, adding a harmonic haze that rides atop the fat, grinding wall of gain. This new voicing Mode adds even more versatility to the already powerful array of sounds in the Encyclopedia of Heavy that is the JP-2C. And with the ability to run SHRED active on one or both high gain Channels, combined with your no-compromise EQ choices, you can now craft the ultimate Crunch rhythm and Lead sounds in the same amp and switch instantly between them. Freedom! You’ll find our classic, rich all-tube REVERB on the JP-2C but with greater control and performance flexibility than the original IIC+. Each Channel features its own REVERB blend control. You’ll find our classic, rich all-tube REVERB on the JP-2C but with greater control and performance flexibility than the original IIC+. It can be auto-set to “On” all the time or set to “Off” or “Footswitchable” (on/off) via the REVERB TOGGLE SWITCH located in the lower left corner of the EQ 1 Window. Each Channel also features its own REVERB blend control located on the left side of the rear panel. We’ve included our popular CABCLONE™ D.I. Cabinet Simulator and Recording Interface for convenient direct live or recording applications without the need for mic-ing, although you can do that as well for a blend of live speaker and direct sounds. The full compliment of Voicing options from our stand-alone CABCLONE has been included. The JP-2C features a fully buffered, tube FX Loop that can be auto-set to “ON” or is also MIDI switchable via the FX TOGGLE SWITCH located in the upper left corner of the EQ 1 Window. We’ve included our popular CABCLONE™ D.I. Cabinet Simulator and Recording Interface for convenient direct live or recording applications without the need for mic-ing, although you can do that as well for a blend of live speaker and direct sounds. The full compliment of Voicing options from our stand-alone CABCLONE has been included here; CLOSED BACK, OPEN BACK and VINTAGE. This greatly increases the versatility of this feature for different sound styles. 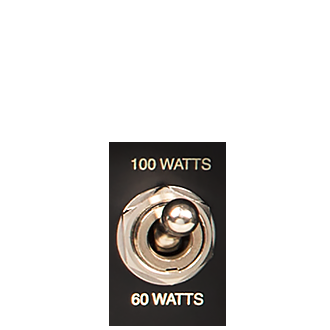 Other features in addition to the balanced XLR Output include Speaker MUTE, an Instrument/Line LEVEL switch and GROUND/LIFT options. Since the JP-2C contains our CABCLONE D.I. Cabinet Simulator and Recording Interface, all the elements for a great HEADPHONE Output were available so this is also included. This Cabinet Simulated Stereo ¼” Output captures the entire sound of the amplifier – power section and all. This HEADPHONE Output makes for convenient and inspired practicing in environments where the sound of a speaker cabinet is not ideal or cannot be used. A STORE toggle switch allows simple one-touch writing and control of the JP-2C’s Amp Channels, Graphic EQ’s, Shred, Reverb and FX Loop to any of 256 MIDI Program Numbers. 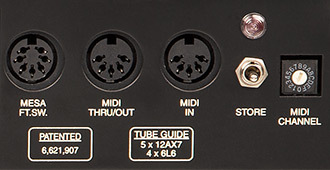 Three DIN jacks, one 8-Pin for the MESA Foot Controller, and two standard 5-pin DIN jacks for MIDI IN and THRU/OUT are included for true connectivity and a number of ways to access the amazing sounds and pro features in the JP-2C. A STORE toggle switch allows simple one-touch writing and control of the JP-2C’s Amp Channels, Graphic EQ’s, Shred, Reverb and FX Loop to any of 256 MIDI Program Numbers. Storing the settings of these features is as easy as selecting a MIDI Program number on the Foot Controller (or Computer) and toggling the STORE key. There is also a mini MIDI Channel Rotary Selector for syncing of the MIDI Channel used by your Controller of choice. 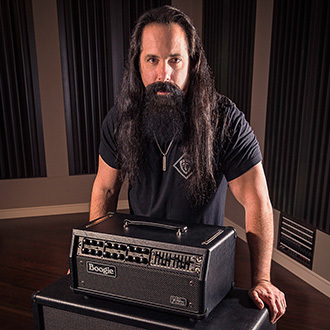 The new John Petrucci inspired JP-2C takes our legendary MARK IIC+ platform to a whole new realm. Contact a MESA Dealer to learn more about it today! Head: Dimensions: 9 1/4" H x 18 3/4" W x 10 7/8" D • Weight: 40 lbs. Rackmount Dimensions: 7" H x 19 1/8" W x 9 1/2" D • Weight: 35 lbs.